As an adult, you probably have experienced low back pain, in fact the AANS (American Association of Neurological Surgeons) states that 75-85% of adults will experience some form of back pain in their lifetime. As you may know, low back pain can greatly affect your life and make daily activities very difficult. Before we dive into how to treat low back pain, let’s take a look at why you may be dealing with low back pain in the first place. Because the low back is a main area of stabilization, support and rotation, many different factors can contribute to pain felt there. Some of the causes include strained muscles, sprained ligaments, nerve irritation, degeneration, overuse, intervertebral disc injury, spinal stenosis, scoliosis as well as an acute injury. Overuse/acute injury is a very common cause of low back pain. A low back injury can occur by doing a lot of activity that our body isn’t prepared to do. This could be anything from repetitive lifting to being a weekend warrior. Acute injuries can happen from activities you perform on a regular basis or an activity you have never done before. As we age, our bodies slow down. The low back experiences a lot of wear and tear over the years which may result in damage. One form of damage that can occur is in the form of disc degeneration (the wear and tear, shrinking, and collapse of intervertebral disc). Another is spinal stenosis (narrowing of the space around the spinal cord). When an intervertebral disc (the shock absorbers of the spine) is damaged the result can be a stretching known as an intervertebral disc bulge or a rupturing known as an intervertebral disc herniation. Scoliosis may also be a cause of low back pain. Scoliosis is an abnormal curvature of the spine. 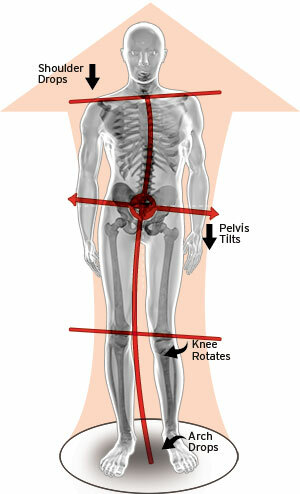 A scoliosis can cause your back to be off balance and become strained, thereby causing pain and stiffness. Low back pain symptoms can vary greatly from person to person in nature, frequency and intensity and are often different depending upon the cause. Your pain may be dull or sharp. It may constant or intermittent. It may get worse with standing, sitting, bending, or walking. Pain may even extend into your buttock or down your leg. Symptoms can vary a lot from person to person. Getting an examination with Dr. Boroditsky is the best way to assess what treatment plan is best for you. Prior to starting any type of treatment, it is always advisable to first see an appropriately trained spine specialist to develop an appropriate treatment program for your specific condition and medical history. Pain medication. Typical pain medications used to treat the lower back pain include acetaminophen, NSAIDs, oral steroids, narcotic drugs, muscle relaxants, and anti-depressants. Each type of medication has strengths, limitations, and risks, and the patient’s particular problem in the lower back and overall health will determine which pain reliever, if any, is indicated. Heat or ice. Application of a cold pack or heating pad can help relieve low back pain. Some people find that alternating between the two works best. Manual manipulation. This treatment maybe applied by a Dr. Boroditsky! He can improve your pain by manually and gently manipulating the vertebrae away from the nerve, reducing pressure. This will greatly improve your pain. Manipulations also increase flexibility, improving blood flow and reducing muscle tension. Therapeutic massage. Massage therapy is thought to improve blood flow, reducing muscle stiffness, and decrease stiffness. Exercise. A program of back exercises and physical therapy will usually include a combination of strengthening, stretching, and low-impact aerobic exercise. Call 763.390.1323 today to schedule an appointment, we can help with your low back pain! The connective tissue, called the plantar fascia, on the underside of the foot is critical to maintaining the foot’s healthy arched shape. Injury and certain health conditions can cause the fascia to stretch out and flatten, but so can everyday, ongoing stressors like walking and standing. Once the fascia stretches out, it is unable to “spring back.” With the foot structure flattened, the body’s very foundation is in trouble. Problems with your feet can affect your entire body, from your legs to your back, your neck, and even your shoulders. The entire human body is connected, which is why one affliction can easily affect a seemingly unrelated part of the body. Oftentimes, pain and discomfort don’t directly relate to flat feet, but rather to how they affect your gait (your stride or the way you walk). Some people have one leg that’s shorter than the other (usually because of scoliosis, an unusually curved spine); this would affect their gait and affect their feet and spine. That can affect their ribs, internal organ locations, and how their bones are structured all over their bodies. The way you walk is dependent on the shape of your feet and the shoes you wear. These factors can affect your entire body over the years. For example, if you wear unsupportive high heels every day, your feet become susceptible to hammertoes, bunions, calluses, and corns. The rest of your body may develop joint problems, back problems, stiffness, fatigue, and strain. Wearing supportive shoes distributes weight evenly when you land and encourages a stable gait. People with flat feet often walk on the sides of their feet or have balance issues, so it’s essential to wear supportive shoes. Your feet are connected to your legs by tendons and ligaments, some of which connect the arch of your foot to the back of your calf. Problems with your feet can affect your lower legs because of this, but the way you walk may also play a part. Binding the feet to make or keep them small. Corsetry; using a corset to manipulate the body’s shape into an hourglass figure. Elongating the forehead through binding, practiced most famously by the Mayans. It’s a little scary because there could be a massive number of health issues that stem from things like these, but people do it anyway. Consistently wearing high heels or shoes that are too tight can cause other, less desired types of reshaping like hammertoes, claw toes, bunions, and corns, and the way a person walks can affect the way the feet, legs, and back function. Prolonged or continuous strain can cause permanent problems. Everything is connected, which is why your feet can cause so many problems all over your body. If you have a foot deformity, you change the way you walk to avoid pain subconsciously. Have you ever noticed that if one of your toes hurts, you avoid hurting it more while you take each step by limping or walking differently on that foot? Usually this is temporary, but for someone with a foot deformity, this adjustment in gait can be permanent. Having flat foot in particular can cause misalignment with the ankle, which causes joints to connect differently, which can cause misalignment in the knee joint. That can affect your hips, which also affects the way you walk. That affects the spine, especially your lower back. It makes sense that this could happen… our feet are actually pretty delicate and our bodies are complex. Orthotics, or custom insoles can be customized to your feet, are affordable, and will fit into your shoes subtly. Though they won’t solve everyone’s foot pain problems, they are a great place to start for relieving foot pain, leg pain, and lower back pain caused by your feet. Consult with a Shane Boroditsky, D.C., for possible orthotics, which are usually custom-made. Though store-bought orthotics may work temporarily, custom orthotic inserts are built to last and customized to your feet, your specific foot problems, and your gait. Throughout the past few weeks, we have been discussing treatments that Minnesota Chiropractic and Rehabilitation offers for our patients. This week, we would like to discuss rehabilitation care and how we can help you get on your feet faster after an accident, or for overall rehabilitation for what you have been experiencing. Rehabilitation care is incorporated after your pain is gone, and you have reached the stabilization stage of care. In this stage, you may feel much better, but you still want to receive chiropractic care. You may be wondering “Why would I keep going back if my pain is gone? !” Your spine has actually been misaligned for a long time and your body has now accepted that misalignment as being correct – the body, muscles and spine must be retrained! This takes time! Unless the spine and joints are retrained with adjustments and kept in the proper position for a longer period of time – your body will naturally go right back into the misaligned condition. Along with chiropractic care, the stabilization stage also includes rehabilitation. Rehabilitation includes stretching and strengthening exercises taught by our doctor to further improve your condition and help your muscles and other tissues heal more completely. Dr. Boroditsky will teach you a variety of strengthening and stretching exercises to do at home to improve your condition. He may also suggest different exercises such as walking, swimming or biking. Dr. Boroditsky teaches each patient a rehabilitation program that is unique to them, to further help them as much as possible. When you take the time do these exercises and stretches at home, you will notice yourself not only getting stronger, but your adjustments holding longer and more stabilization throughout your body. In the long run, this will help to prevent further injury or re-injury. During the correction / restorative phase of your care, you will not have to receive treatment as often as you did during the first phase of care, depending on your particular circumstances. Do not be discouraged if you have mild flare-ups in your symptoms on occasion. This is normal. Fare-ups are bound to occur during this phase because your body has not fully healed. Depending on the severity of your injury or condition and how long you have been suffering from it will determine how long this phase of care lasts.